Bobby Vick of PrecisionHawk lands a drone. Drones are helping a study of plant diseases get off the ground, Drew Wilson reports for the Wilson Times in North Carolina. 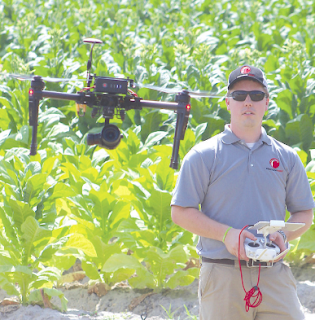 North Carolina State University student Joshua Henry is collaborating with North Carolina Cooperative Extension and drone company PrecisionHawk to gather information about diseased tobacco plants interspersed with healthy plants over an acre on Vick Family Farms. "We are looking at nitrogen, phosphorous, potassium deficiencies as well as magnesium and sulfur deficiencies and boron toxicity," Henry told Wilson. Henry, a doctoral student in the College of Agriculture and Life Sciences, placed about 50 plants with each disorder, 300 total, among an equal number of healthy tobacco plants. Examining so many plants is a tall order, but drones can fly in a search pattern grid and gather a great deal of information quickly with remote sensors. Each nutrition deficiency creates a unique light signature; since the drones' remote sensors collect 270 narrow bands of light, they can pinpoint which disease a plant has. Drones don't require much expertise, said PrecisonHawk solutions engineer Bobby Vick, whose parents own Vick Family Farms: "All you have to do is tell the drone where to go . . . The software is telling the drone what positions to go to and what altitude and speed to fly. The drone actually flies itself. Any one of us out here could fly these drones in five minutes time and feel comfortable doing it." Graduate student Henry hopes drones, which can cost as little as $1,500, can help farmers develop better fertilization plans. Farmer Linwood Vick agreed: "I think it’s always good to be looking ahead and not getting stuck in the past, so we are looking to do new things and new technology."